SHEHJAR - Web Magazine for Kashmir :: Who Am I? A while ago my Sunday school teacher asked our class the simple question, “Who am I?” Initially I sat down at my computer screen and began to think, “Wait, this question is a piece of cake. Who am I? Well, I am Arman.” But I knew it was deeper than that. Then I thought, “I bet they want me to be all saintly and virtuous.” And then after that I thought, “Hey Arman, why don’t you shut up with the premature presumptions and just think about the topic.” So I thought, and thought, and thought and then I came up with it. Throughout the rest of the article I will portray my discoveries. I am not just a person on this Earth. I am a person in this universe; one of about 6 billion known. I know this sounds kind of vague in the sense that there are 6 billion people on Earth and in the universe. I said the universe because most of us intellectually believe that the universe is all and everything that is right now. But mentally most of us limit our thoughts of the universe to just the Earth. We do not explore the possibilities that there is life outside of Earth. In fact I don’t think that it is as much of exploring the possibilities, as it is being ignorant to the fact that there might be life anywhere else. And many people look down on those who believe in "alien" life. From a Hindu perspective, I am merely a puppet in the master play. I have my script written out for me and my setting and background are already established. All I need is a hand to guide me through each act. In this example the puppet represents the body since it is what is doing the action that it is supposed to do. The script symbolizes one’s dharma in the sense that you can choose to follow it or not but if you do follow it you will be rewarded. The hand represents the soul or atman, since it is what makes your decisions and steers you in the path that you want to go. And finally the master puppeteer who writes the script and performs it is none other than Bhagwan. Taking a break from all this philosophical stuff I am but a human. So I come with some basic tools; first there is the obvious that I have five fingers (hopefully), and a mouth, and ears. But I also have brains. I have sense. Yet also as a human I have been living with a disregard for the other creatures around me. We destroy our surroundings for our personal gain. In fact I just sneezed into a napkin made out of a chopped down tree. Yet I am glad that God has reincarnated me into a human. That’s where I got stuck. I didn’t know what else to say. After all, I’m not made of ideas guys. But I kept on pondering, brooding, contemplating, and many more synonyms for thinking. Frankly I am Arman. I knew that at the beginning of the essay. This answer seems like I took the easy way out but frankly I think it fits flawlessly. Your perception of me differs based on who you are and what your relationship to me is. To my parents I am a son, to my teacher I am a student, and to a reader I am a writer. But really why should we leave the characterization of ourselves up to other people? How would they know who we are? What they know about us is our, what I like to call, outer shell. They know what we appear to them like. Similarly, what you think about others is based on your relationship to the outer shell of the given being. Now we all modify our outer shells based on the person who is interacting with us. We will act differently towards a teacher than we will towards our friend. This means that anything you know about anybody is not exact, not real. Maybe this world is unreal, maybe this universe is unreal. The only thing you know that is real is what you know about yourself. Hold on there Arman. Are you saying that grass is not really green, that the sky is not blue, that a rectangle does not have four sides, that Batman is not really Bruce Wayne? Well bluntly, yes. I am trying to say that the concrete facts we know that have been cemented in our brain since birth may not be correct. What if oxygen is not the only gas our lungs can intake? What if we are not the only people out there. Ever since we are born we are taught not to believe anything without a substantial amount of evidence. Are there aliens? Well do you see any aliens? That is how we have evolved to think. But then what we know about other people and cultures are not even our own opinions. Those are based on other people's opinions. Lets say you grow up eating with hand, so this is accepted by yourself and those alike you who eat with hand. Yet others who have grown up eating with tools might look down on this and your act may be described as disgusting or repulsive. Now how did the person with tools learn that using tools is the right thing to do and using the hand isn’t? From their parents or from some other person of influence. So our opinions of other people are derived from the opinions of others many times. So if our outer shell is not real, if our opinions are not real, and even our surroundings aren’t real, what is real? Well honestly, we at the core are real. By this I do not mean the outer shell or our appearance because those are just things that help people characterize and distinguish us from others. Outer shells are the basis for classification of us by other people into categories whether it is nice, fun to be around, or excruciatingly, horrendously irritating. But these categories categorize the person’s opinion of us. But not who we actually are. Because with anyone, if you look deep enough in yourself and with honesty. you will find who you actually are. Whether you are selfish, funny, or fastidious that is who you actually are. You might think that I’m foolish, crazy, or just plain stupid. And maybe I am just a 12 year old with too much time on his hands to write articles like these. However this is what I think. And you did read this far so I’m guessing that you must not have bene that bored. 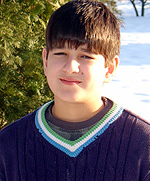 *Arman Koul is a 12 years old, 5th grade student from Andover, MA. He enjoys reading, music and sports, not necessarily in that order. Hi Buddy you are neither foolish nor crazy.You are not stupid even.Your ideas are brilliant and your thinking is very deep.You have moved from physical to transcendantal with ease.It is not easy.It is the job of a great thinker.Your diction is appropriate and touches the soul.What else can I comment on this masterpiece? This is a great article and can't believe that it has been written by a 12 year old boy. Great, keep it up and keep on writing.